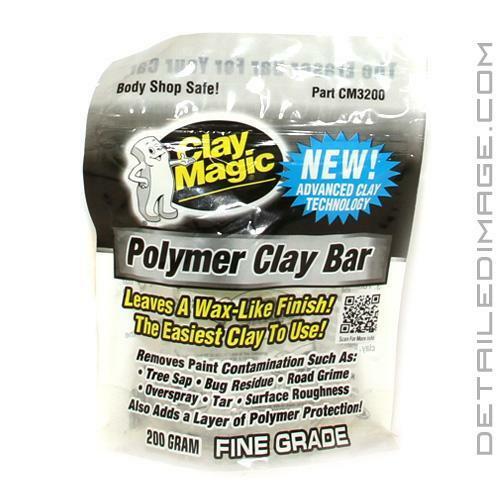 The Clay Magic Polymer Detailing Clay Bar will help you remove embedded contamination from the paint safely and easily! From a distance, your clear coat may look smooth, but at a microscopic level it is actually porous. Contamination can easily become lodged between these areas and reduce the optical clarity of your paint, but this issue can be corrected with a good clay bar and lube! Take your favorite clay lube, spray it onto the surface and glide the Clay Magic Polymer Detailing Clay Bar across the surface. This high quality clay bar will help you safely pull embedded contamination from the paint, improving cleanliness, slickness and clarity. Contamination such as paint overspray, tree sap, bug residue, industrial fallout, and stubborn dirt are no match for the cleaning power of this bar. Another huge benefit that helps this clay bar stand out among others is the embedded polymers in the clay. These polymers help this clay bar glide across the surface easier than before and it's easy to shape in your hand. It's a very flexible and malleable clay bar that won't break apart like low-quality bars. Clean your paint and help future layers of protection (i.e. waxes, sealants, coatings) adhere to the paint properly with the Clay Magic Polymer Detailing Clay Bar! Clay Magic clay bars are safe on all types of vehicles and safe on the clearcoat, paint, chrome, glass, fiberglass and plastic. The Easiest Clay To use! Also Adds a Layer of Polymer Protection! New Clay Magic Polymer Clay is the easiest clay bar to use! This clay bar contains an embedded polymer that helps to glide the bar over surfaces better than ever before. It makes your finish as smooth as glass, while removing harmful surface contaminants such as paint overspray, tree sap, bug residue, industrial fallout, and other stubborn dirt. The polymers in the clay also leave a protective shine. Now you can clean and shine the paint in one easy step! If you're not using Clay Magic on your paint, then you're just waxing over dirt! Clay Magic is safe on all types of vehicles; cars, trucks, SUVs, motorcycles, RVs, boats and airplanes. Clay Magic is clearcoat safe and can be used on paint, chrome, glass, fiberglass and plastic. Thoroughly wash and rinse the entire vehicle. Spray #49-Body Shine, Clay Lube, or #050 Lubri-Shine (non silicone) onto 3' x 3' surface area. Form Clay Magic Polymer Clay into an oval shape. Gently rub the clay over the wet area using a back-and-forth motion until you feel the contamination is removed. Wipe the furface dry with a clean microfiber cloth. It's that easy! To clean the clay bar, simply fold it in half and reshape. To store the clay bar, spray a little clay lubricant inside this clay bag, drop in the clay, then ziplock it. I'm struggling to find a huge difference between this product and the more traditional "blue" clay from Clay Magic. There is an obvious softer, more pliable feel. There is the benefit of being able to see contaminants that are pulled from the paint more easily due to the almost white color. But I'm not sure about the "Polymer" addition into the name. It's suppose to give a wax like finish after use, which is confusing. The blue clay does the same thing in my book. If nothing else, I'll say that it's slightly less aggressive than the blue, so more confidently used on softer paints.